I feel like more more than ever, I’m being bombarded by all different types of distractions. Like not just sometimes either, but all the time. Whether it’s an add for Geico insurance while I’m trying to watch a TED Talk on YouTube. A pop-up window for a fat-shredder supplement while I’m reading a fitness article online. A commercial on how to make millions of dollars overnight while I’m listening to Pandora during a workout. A notification that someone liked my Facebook post while I’m creating a client proposal. Commercials, ads, pop-ups, notifications, dings, chimes… you name it. Even click bait for heavens sake. You think I’d know better. Headlines that grab my attention and so I click on them just to realize the story has nothing to do with the headline and is of little to no value to me. All weapons of mass distraction as I call them. Distractions designed to rob me of the focus necessary to do what I must do to successfully achieve my goals. Whether it’s my marathon training schedule I’m currently following, the new leadership approach I’m taking with my business, even something as simple as being present with family and friends when I’m with them. Away from my phone, from the distractions, that are ready to rob me of quality time with family and friends. I know I can’t control all distractions that come my way. But I can control how I react and respond to them. What I do consciously to minimize these distractions. For example, putting my phone on airplane mode when I’m with family and friends. Turning off all my phone app notifications. Closing all browsers on my computer when I’m working on a project. None of these by the way are easy for me to do. But I do them anyways. Because my attention, my focus, my time, my goals, my family, friends, and business matter way more to me than silly distractions. 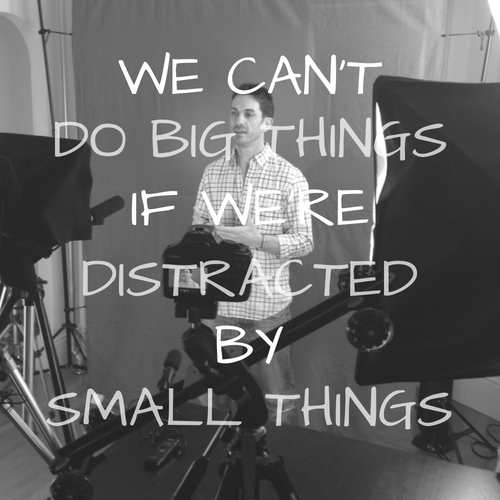 Not to mention, I know I’ll never achieve big things (my goals) if I allow myself to be distracted by small things.